The Calculate Totals button is missing in Translation Office 3000. 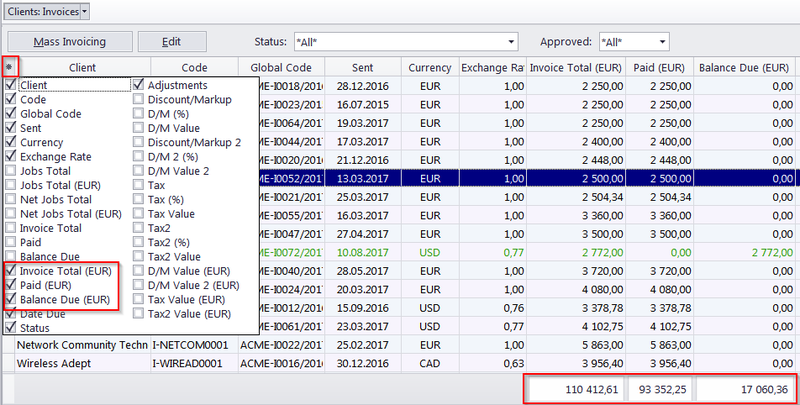 Q: I am really missing the "Calculate totals"
A: Totals are being displayed automatically for "Job Total (EUR)" columns in the Client Jobs window. Please click the asterisk in the top-left corner of the table and check "Job Total (EUR)". Now you should see the totals for client jobs in the status line at the bottom of the screen. Note: "EUR" may be different in your databse, it displays your base currency, as selected in "Advanced Settings >> General". If you do not see the footer, right-click the table and select "Grid Settings >> Show Footer"